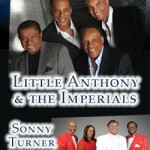 Sammy Davis, Jr. is responsible for one of Jay & the Americans' biggest hits - Pop, Rock & Doo Wopp Live! 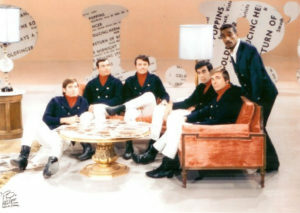 Jay & the Americans on the set of Hullabaloo with Sammy Davis, Jr. 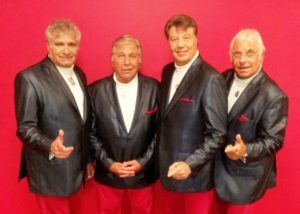 In April 1964, Jay and the Americans were riding high, having had a couple of hits under their belt and working on driving their new single, “Think of the Good Times”, up the charts. The group made an appearance on the TV show Hullabaloo which happened to be hosted that day by Sammy Davis, Jr. Sammy took a liking to the group and the group revered Sammy. “What sealed the deal was when he found out that we were Jewish,” recalls founding American Sandy Deanne. He invited them to his home for a Passover Seder that same week. He also mentioned that he would be on the Tonight Show, guest hosting in the absence of Johnny Carson in a couple of weeks. The group remarked that they would love to do the Tonight Show as they were all avid fans. “But we knew that [the show’s booker] Freddie de Cordova and [host] Johnny Carson were both anti-rock ‘n roll,” recalls Sandy. Sammy said he would make a call and try to get the group on one of the episodes he was hosting. He called Freddie de Cordova while the group waited and watched. Sammy pitched the idea to de Cordova and they thought they might be out of luck when they saw the expression on Sammy’s face as de Cordova apparently denied Sammy’s request on the other end of the line. That disappointment turned to shock quickly though, as Sammy told de Cordova that if he couldn’t have the group on, they should find another guest host. Davis hung up the phone and told the group it was a done deal. “We were awestruck,” says Sandy. United Artists (the record label for whom the group was recording at the time) was as ecstatic as the group was since they were getting ready to release a new single called “When It’s All Over.” On the flip-side of “When It’s All Over” was a song called “Cara Mia.” The song had been a hit for David Whitfield in 1954, whose vocal was accompanied Mantovani’s orchestra on the recording. Jay and the Americans had begged the record label to allow them to record the song for years. They had been doing it in their live show since 1963 but when they asked the record label to put it out as a single, they looked at Jay #2 and said, “Who do you think you are? Alan Jones?” Well, finally the record label had relented and allowed the group to record the song as the B-side to “When It’s All Over”. United Artists thought for sure the group would sing the intended “push” side on the Tonight Show appearance. Instead, the Americans handed the band sheet music to “Cara Mia.” At first, United Artists was horrified as they had already begun promo on the A-side of the record. But as calls came in to NBC studios asking where they could buy this new record by Jay and the Americans, NBC referred those calls to United Artists. UA realized they had a hit on their hands and immediately begin promoting “Cara Mia” as the hit. “Cara Mia” hit the charts in May 1965 and peaked at number 4 nationally. But its likely that none of it would’ve happened if it wasn’t for Sammy Davis, Jr. 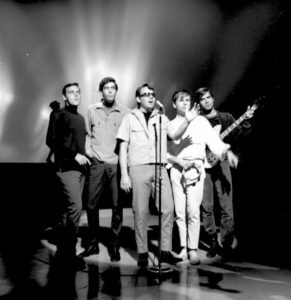 In 1963, Jay Traynor left the Americans following the success of “She Cried.” The group’s guitarist, Marty Sanders, brought his friend David Blatt to audition for the vacant lead singer slot. Sandy recalls the staircase leading into his basement (where the audition was held) filled with Sandy’s parents and several neighbors who came running in to hear who was singing. 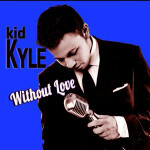 The song that won him the audition? “Cara Mia,” a full 2 years before the group would record the song. The record company did NOT want the group to record the song. UA only relented after they had a few hits. Even then, they put it on the flip side of the release that was intended for promotion. Although songwriter credit goes to Tulio Trapani and Lee Lange, these were actually pseudonyms. They were actually Mantovani and Whitman’s producer Bunny Lewis. Mantovani’s orchestra accompanied David Whitman on his 1954 recording of the song. The Americans’ recording of the song seems to have a life of its own, long after its release. A DJ had played the song non-stop, sparking a frenzy over it. Their version charted even higher in the Netherlands in 1980 than it did upon its original 1965 U.S. release.